There is a hue and cry over Yogi Adityanath led Uttar Pradesh government dropping the Taj Mahal from its list of important tourist destinations. Some media reports also stated that the Yogi government has dropped Taj from its heritage monument list as well. How does that matter, I wonder! Taj Mahal, one of the most visited monuments in India, is one among the seven wonders of the world. Taj Mahal is adored by architects and worshipped by lovers. It hardly matters whether the Taj Mahal is included or excluded from any list of the UP government. A senior official of the Archaeological Survey of India (ASI) wondered why a section of the media and society was even bothered if Taj is being included or excluded in UPs heritage monument. “Taj belongs to everyone and it is not of any government. If any government has control over it, it’s the central government and ASI. It’s ASI which conserves, preserves and advertisse Taj to the world and it’s the central government which funds for the same. The government at the state only enjoys the benefits of it being situated there. That is it,” the ASI official, who has been former chief of Agra ASI circle hence in-charge of Taj Mahal, told Governance Now. According to “UP Tourism: Unlimited Potential”, a booklet released by UP tourism minister Rita Bahuguna Joshi on the occasion of UP government’s completion of six months in office, UP has a huge potential for private investment to promote tourism. As per a report in Financial Express, the Taj Mahal failed to get any space in the booklet released by Joshi. The state government has laid stress on promoting several religious and cultural circuits in UP that includes Ramayana circuit, Krishna circuit, Buddhist circuit, Vindhyachal circuit, Chitrakoot circuit, Awadh circuit, Jain circuit, etc. In fact, the booklet, which has a picture of the Ganga aarti on its cover, also mentions eco tourism, and adventure tourism in its list. It’s important to mention here that Taj Mahal is the third most visited monument in India by foreign visitors while it’s on the second spot for being visited by the domestic tourists. The monument also earns the maximum revenue for the tourism department. The government’s first state budget for 2017-2018 too had omitted any mention of Taj Mahal in a special section titled ‘Hamari Sanskritik Virasat’ (Our Cultural Heritage) in finance minister Rajesh Agarwal’s budget speech. A senior official from UP tourism department said that the state government hardly give any funds for Taj Mahal but only take its share from the tickets being sold by the ASI. 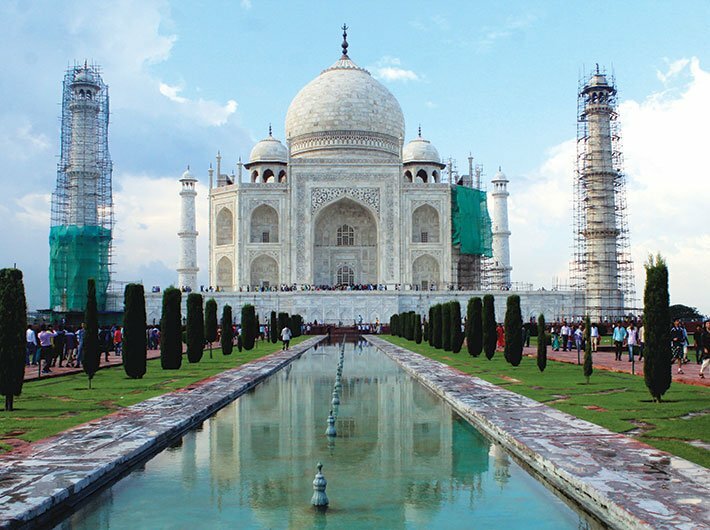 “Agra Development Authority takes almost half of the share of tickets of Taj. And in return they build roads and infrastructure around Taj Mahal. Rest, whether the state funds the Taj or not, it hardly matters. We only earn from it,” he added. Uttar Pradesh BJP spokesperson Chandramohan told Governance Now that media is misinterpreting every statement given by the Yogi government which has good intent on Taj. “UP government has given Rs 156 crores to Taj Mahal from the Rs 307 crore given by the World Bank for upliftment of tourism in the state. How can they say that we are neglecting Taj,” he added.